John Carter, who I wrote about in my last-but-one post (“Remembering John Carter”) had a great interest in Achnanthes, the old genus to which Platessa bahlsii (see post of 12 March 2014) would have once belonged. In the early 1960s he wrote a series of papers for the journal The Microscope entitled “The genus Achnanthes as it occurs in British fresh waters”, and which included a key and many of John’s highly detailed drawings (see figure). “I feel”, he wrote, “that many forms are overlooked simply because of their minute size and the extreme fineness of sculpture on the valve.” He spent many hours carefully drawing what he could see down his microscope and, indeed, described several new species. I have long believed that drawing is an important discipline for focussing attention on the properties of organisms and John was an exemplar of this. Within a few years of his death, however, the advent of high-resolution digital imaging made it much easier to put several individuals from each of several populations alongside one another in order to study this variation more objectively (see the images of Platessa bahlsii as an example). An illustration from John Carter’s 1961 paper on the genus Achnanthes. 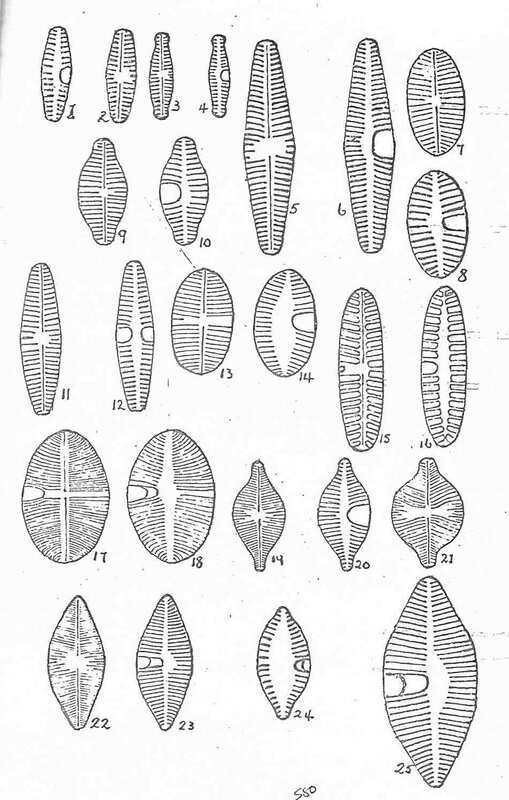 These drawings show several species most of which would now be placed in the genus Planothidium. He attempted, along with two other amateur microscopists, to draw all the diatoms then known from Britain, and their Atlas of British Diatoms was published three years after his death in 1996. It is still sits on the bookshelf beside my microscope, as much for the aesthetic pleasure that I gain from his meticulous drawings of the larger diatoms such as Pinnularia. The book is now, alas, out of print. My favourite memory of John Carter? I mentioned to him how I found the German in Hustedt’s 1930 edition of the Susswässerflora von Mitteleuropa much easier to understand than that in Krammer and Lange-Bertalot’s revised version. He smiled as he recalled a conversation with Lange-Bertalot: “Horst, I said, you speak wonderful English but you write terrible German.” I recounted this anecdote to a German colleague last year who looked horrified and told me that Lange-Bertalot is admired in Germany for his very meticulous and precise technical German. This story sums up for me John Carter’s archetypal no-nonsense Yorkshire attitude that treated everyone from students to eminent professors in exactly the same manner. Carter, J.R. (1961). The genus Achnanthes as it occurs in British fresh waters. The Microscope 12: 320-325. Hartley, B., Barber, H.G. & Carter, J.R. (1996). An Atlas of British Diatoms (edited by P.A. Sims). Biopress, Bristol. This entry was posted in Uncategorized and tagged diatoms, John Carter, microscopes. Bookmark the permalink.